It's been some time since we've been to a Naked Fish (and first time to the Totten Pond Road location) and thought we might try this location as an option for a last-minute choice for a family dinner. It was extremely disappointing. The tone for the evening was set by our server who seemed instantly to have an aversion to waiting on a party with two young children. [Granted, families with children can be challenging, but she was jaded from the beginning.] She was very unwelcoming and spent the absolute minimum of time at the table each time she stopped at it. One of our children has dietary restrictions and as a result we require a little extra time and information to find out what the best food choices are for her. The server was completely unhelpful in that regard. Many restaurants now have managers or senior staff work with a party where there are food allergies, especially if the servers are new or don't have deep knowledge into the preparation of the food. Sadly, they didn't do this. And having found that one of our kids's choices contained products unsafe for her the server gave us no information about alternatives we might consider on the menu and it wasn't until 20 minutes into the meal and seeing the food at other tables that we found something that was equally appealing for a young child (which turned around her dining experience but not ours). This experience affirmed for us that the restaurant is for captive hotel guests at 95/128 who have a dearth of dining options. We won't be eating there again nor would we recommend it to others. Boston Standard Plumbing & Heating, Inc. The reviews here of Boston Standard, and especially Joe Wood, are dead on. This is a great firm to do business with and have easily become our "go to" plumbers. We had a hot water heater that we knew was near end of life start acting a bit flaky. They came once to fix it and once to follow up on the work (at no cost). Late that afternoon, the tank starting gushing water. They were able to get into a plumbing supply place at the 11th hour to get us a new tank and come by that evening to install it. They demonstrated simply outstanding support and service. Peter and Chris were also fantastic. These guys get it that service and attitude make all the difference. Zen is a relatively recent addition to the dining scene on Beacon Hill. Most things in this part of town tend toward the small grill or sandwich shop so it's nice to have something cultural as an alternative. Zen's sushi seems a cut above the kind of sushi that you'd be able to pick up at Whole Foods though it's not top of the line either. Their take on other traditional Japanese fare (miso soup, soba noodle dishes) is nothing outstanding. Prices aren't ridiculous but it's not an inexpensive meal out either. Titus Sparrow Park is a genuine meeting ground for families in the South End. In a city where class and race divisions can be so pronounced, people really come together at this park. There is ample green space for kids to run and play and two playground sections, one for toddlers and one for older kids. The sandbox is the big draw bringing parents out early in the mornings and well into the evenings. Parents who come to this park are genuinely friendly and very interested in meeting other people. In the summers, the park has a jazz concert series on Wednesday evenings making it a great place to pick up dinner and have an evening picnic. If you watched the early years of "The Practice" this was the place that the cast frequented on the show (before it was Emmetts). Given that it is an Irish pub there aren't that many standouts food-wise. They do a decent job on traditional stuff. The draw here is that its got good beers and that it's a downtown watering hole. Stop in during the NCAA basketball tournament to keep current during lunch. The staff are fairly friendly but warm up to you over time if they recognize your face after a few visits. Silvertone is a basement bar and restaurant in the heart of downtown Boston. Just up from Downtown Crossing, you'd miss it if you were walking quickly up Bromfield. Something about descending down into the bar gives it a sort of speakeasy, loungy feel, and the retro vibe makes for great atmosphere. It's also kind of cool to be able to see the place from above as you go in. Because it's a basement there are no windows but it doesn't feel cramped. It's well lit and the smoking ban helps quite a bit. The calamari appetizer is particularly good, and so is the grilled cheese, and the mac and cheese. It gets pretty crowded pretty quick but it's easy to chill there. I'm a big fan of Motley (pretty much across the street) and I thought I would automatically love Motley Home, but it seems they've got a fair amount of stuff that you just don't need. The original Motley has this fun vibe of hip shirts, books, and jeans but the home store seems like a bunch of stuff just heaped together. The view from the street is enticing but being inside doesn't quite deliver. You might as well just head to Urban Outfitters. With the main branch of the library a few short blocks away, it can be forgiven that the South End branch is fairly small. Though it occupies two floors with a fairly large footprint on Tremont Street, almost the entire top floor is community meeting space. That leaves precious little space for books and other materials. The library tends to be loud during the day which makes it more of a place to browse for things and take them with you rather than stay and do reading. The connection to the Internet, while free, is particularly flaky so bringing your own PC won't get you much as far as WiFi connectivity goes. The library does a fair trade in movie "rentals" which was a bit of a surprise. And their children's book selection is quite extensive. We tend to browse in Borders nearby then reserve the books online for pickup at the branch. Encore has become the de facto place that my family stays when they visit Boston. Staying in an urban b&b gives you a totally different take on the city and Encore is very tastefully appointed. 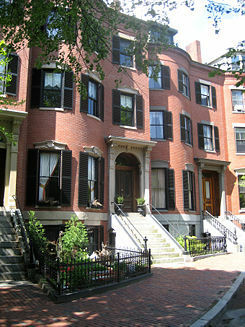 It is right in the heart of the South End with lots of small and independent retailers, and there is a mall nearby too. It's not far from public transportation either. Reinhold the host is is especially friendly and accommodating. This place can be hit or miss, very often on the miss end. The sales team tends to be a bit high pressure and they aren't all that friendly to people who bring their children in while shopping. Especially if you have a stroller (they think we should just stay home?). If you've seen the shoe you want and are comparison shopping on price then it may be worth going. But it's not a great place to get good customer service and a pleasant shopping experience.